Can you check off every item? 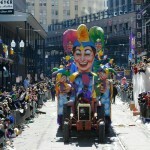 If you’re planning your Mardi Gras itinerary, you likely fall under one of the following categories: You want to put the “Fat” in “Fat” Tuesday and really indulge before the Lenten season, you’re a seasoned local who’s looking for new things to do, or you’re a visitor who wants to get as much in as possible during your Mardi Gras sojourn. Whoever you are, we’ve compiled the ultimate Mardi Gras Bucket list to help you have an unforgettable experience. We challenge you to do it all! 1. Get a Zulu coconut. The pinnacle of Carnival throws, slightly above the coveted glittery Muses shoe (depending on whom you ask), the black-and-gold-painted coconut is the throw to score on Mardi Gras. 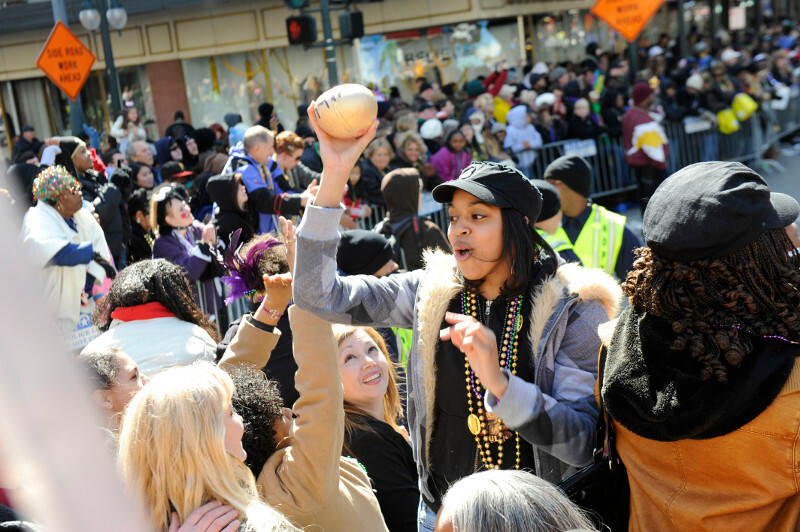 Your best bet is to get up close while watching the parade – riders will hand coconuts to people, not throw them. Zulu gets started at 8 a.m. at S. Claiborne and Jackson avenues, so catch it around there before the coconuts are in shorter supply. 2. Catch the Society of Saint Anne parade. This elusive krewe that gets started early in the morning in the Bywater neighborhood doesn’t really have a set start time. But if you get to the Marigny before 10 a.m. – most people gather around R Bar – you’ll probably catch it. The elaborate costumes and intricate DIY floats are not to be missed. 4. Find Mardi Gras Indians. 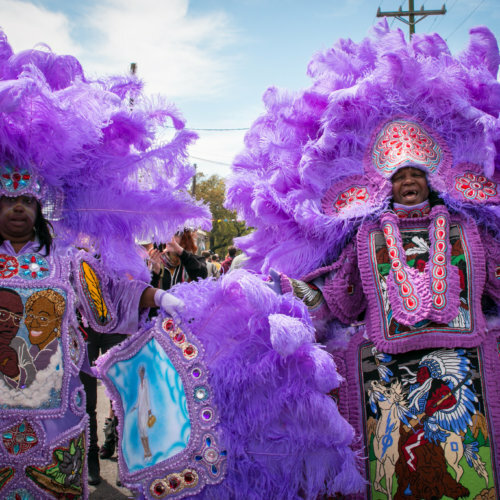 Mardi Gras Indians have their big moment on Super Sunday, but they also parade on Mardi Gras day. As usual, they are pretty secretive and hard to pin down, but sources say that you can usually spot them LaSalle and Second Streets when the Zulu parade passes by, and at the corner of Claiborne and Orleans avenues following the parade. 5. 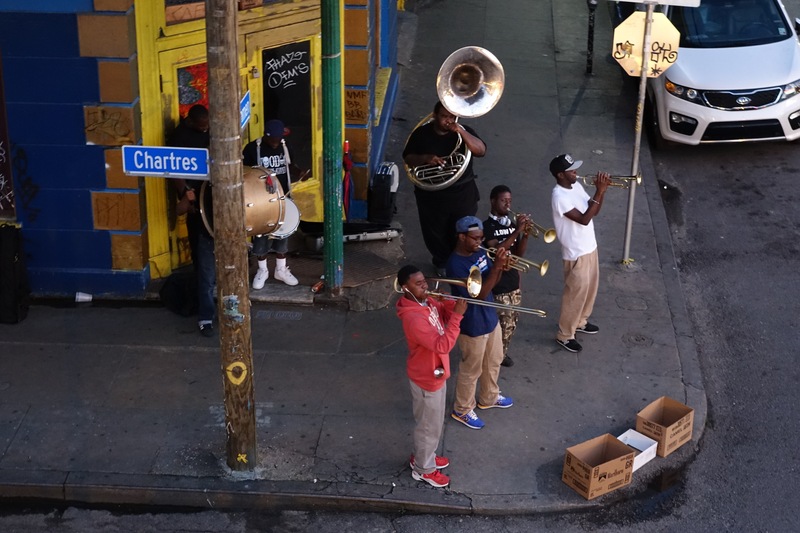 Dance on Frenchmen Street. Between the usual brass bands, impromptu musical gatherings, and the row of clubs bursting with live music, this is the place to boogie down. 6. See the Bourbon Street Awards. Another place to see elaborate costumes is at the Bourbon Street Awards, the ultimate event of New Orleans’ LGBT Mardi Gras celebrations. This outdoor costume contest on Bourbon Street at St. Ann, near many of the city’s top gay bars, is where the city’s gay Carnival krewes engage in fierce competition for bragging rights. 7. 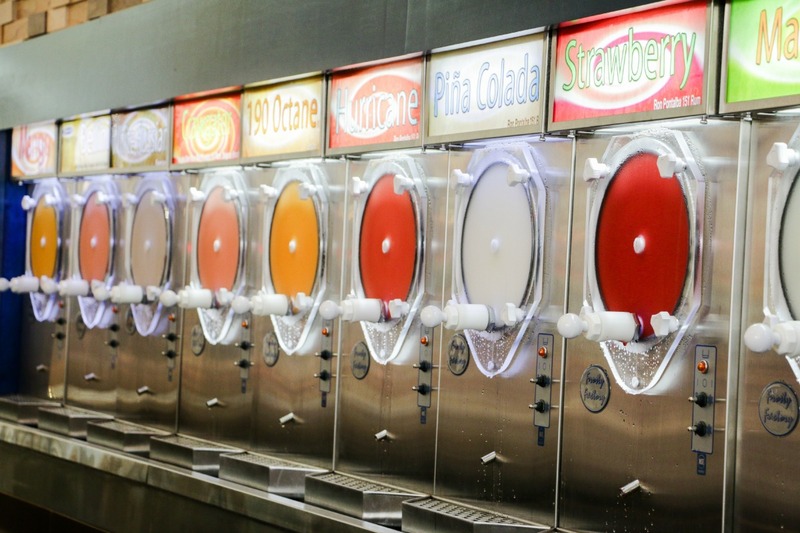 Get a giant daiquiri. Why not? 8. See Rex royalty. The Krewe of Rex is the quintessential traditional Mardi Gras krewe, and the title of Rex is the most coveted out of all Carnival royalty. When the parade passes in front of Gallier Hall on St. Charles Avenue, there is a toast from the mayor of New Orleans, when he hands over the keys to the city to the monarch. The krewe also toasts to former Rex royalty at 3rd Street and St. Charles Avenue, around where many of the former royals live. 9. Make a new friend. Part of the magic of Mardi Gras is meeting friends-of-friends along the parade route and sharing in their hospitality. You never know whose house you’ll end up in, eating the best meal of your life with people you only met that day. 10. 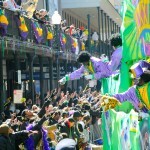 Experience Mardi Gras in a different spot. 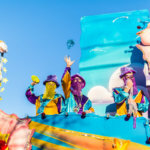 If you’re a Mardi Gras vet you may have your usual locale or itinerary for Mardi Gras, but try experiencing it from a different perspective this year. 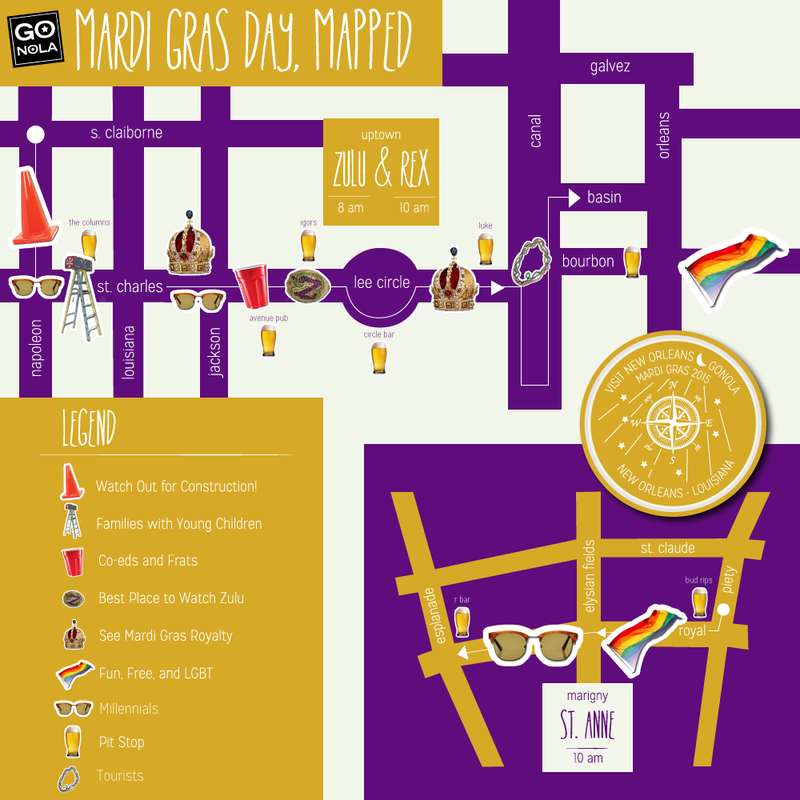 Below we’ve mapped it all out for you, showing you a local’s look at what’s happening along all parts of the parade route, depending on who you are or what you want to see. If you’re a hip millennial who refuses to leave the Marigny on Mardi Gras, maybe head Uptown and experience the magnificence of Rex. Or if you’re used to hanging out Uptown, head to the Marigny for something more under-the-radar.